Eating ice cream and drinking coffee at the same time of day shouldn’t be so discouraged. As people anxiously waited to hear from Punxsutawney Phil for the results of Groundhog Day, on Feb. 2, many celebrated another national holiday, Ice Cream for Breakfast Day. Fargo Ice Cream Shops seized the opportunity to turn the classic dessert into a delicious breakfast. Downtown shops, The Silver Lining Creamery and Scoop N Dough Candy Co., offered specials to those willing to get up on a Saturday morning to go get some ice cream. 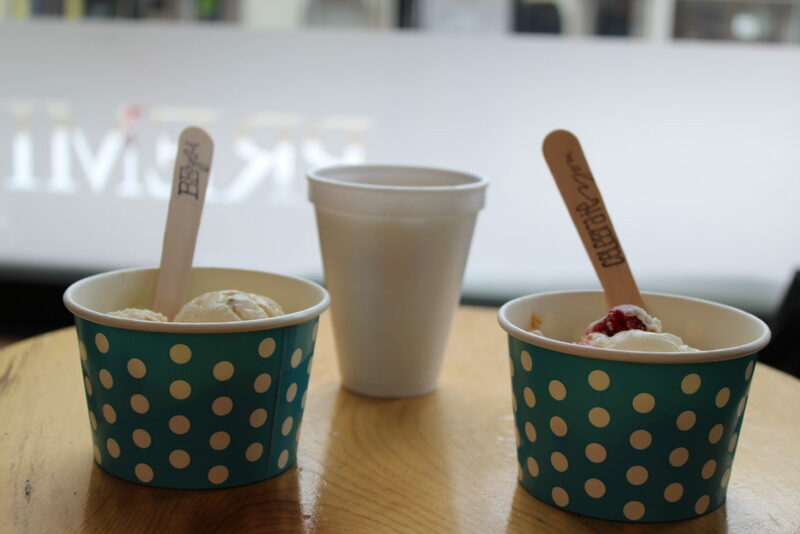 The Silver Lining Creamery used the day to debut their new Feb. flavors, and reopen the shop after having closed mid-Jan. for a winter break. The flavors for this month were chosen based on customer requests via Facebook. Some of these requests turned flavors include Fargo Rocky Road, Strawberry Cheesecake, Cotton Candy and Rose Water. To commemorate the special holiday, they offered a free coffee with purchase from 8 to 10 a.m. At approximately $3.32 per scoop, it was a price point even a college student could afford, as long as they could stand the line. When asked about the day, one of the employees commented about how they thought it was something fun for people to enjoy on a nice morning. Just a block away, Scoop N Dough Candy Co. opened their doors earlier than usual at 8 a.m. for the special day. Bringing in doughnuts from Sandy’s Donuts and cooking up some waffles, they put an ice cream twist on popular breakfast foods for people to enjoy. Though getting in the door was difficult with the crowd of people, once inside, customers could choose from a waffle sundae, doughnut sundae, cereal milkshake, orange juice float, orange juice, milk or free coffee with purchase. With the sundaes being just under $6, they were more expensive, but made up for it in creativity. One menu item that had some people hesitant was the orange juice float. This orange juice and vanilla ice cream combo caused people to realize they judged the item prematurely. Instead, it was compared to a delicious creamsicle. Ice Cream for Breakfast Day attempted to break the social norm of desserts as an only afternoon treat. From the crowds seen at both establishments, it is clear that people were ready for this exciting event. Eating ice cream for breakfast was reminiscent of childhood in which the dream of it was never turned into reality. It was heartwarming to see the cheer of adults, as well as all the families enjoying the day and making memories together. While ice cream for breakfast every day wouldn’t be the best idea, as a national holiday, it is a great day for joy and excitement for people of all ages.